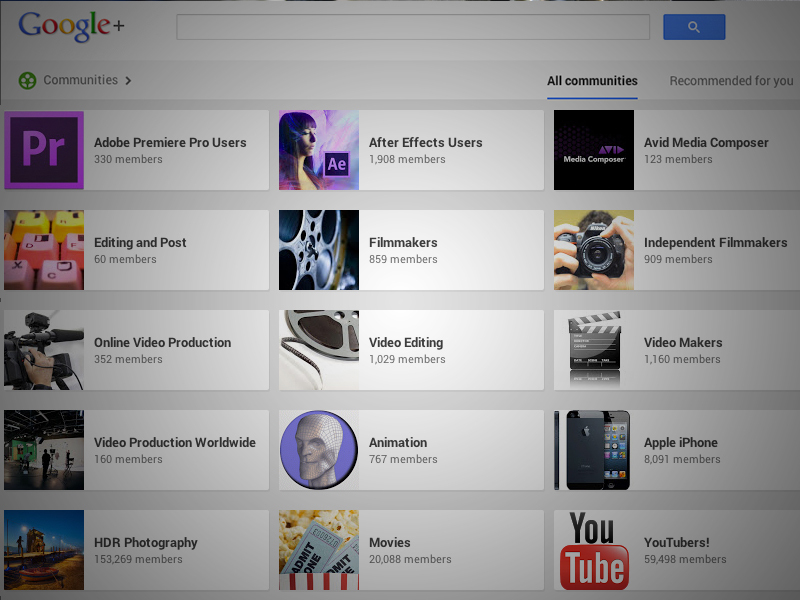 The film and video communities on Google+. In the past I have written about my favorite LinkedIn Groups for the Film and Video Pros as well as Facebook Resources for Digital Video Editors. This week I have a list of my favorite professional communities for digital video editors on the Google+ social network. These communities are great places to share ideas and discover new techniques from users from around the globe. The following list of Google+ Communities are in no particular order other than alphabetical order. Adobe Premiere Pro Users - Users of the Adobe Premiere Pro editing system. This community includes group discussions of new plugins, events and films from users. After Effects Users - A community of like-minded people all looking to learn a bit more about Adobe After Effects and Motion Graphics. This community is a great resource for tutorials, tips and tricks, plugins and job opportunities in motion graphics. Avid Media Composer - This community of Avid Media Composer users includes discussions on troubleshooting and general Media Composer information. Editing and Post - An editing community to share your knowledge, ask questions, post related news regarding tips, plugins, events and jobs in post production. Filmmakers - A community of filmmakers passionate about that has to do with making movies. This group contains discussions about pre-production, post production, gear and DIY solutions. Independent Filmmakers - A way to connect with the independent filmmaker industry. This community includes discussions about filmmaking, film festivals, equipment and script writing. Online Video Production - Learn, share and discuss online video production. This community has discussions on equipment, filming, editing, sound and distribution. 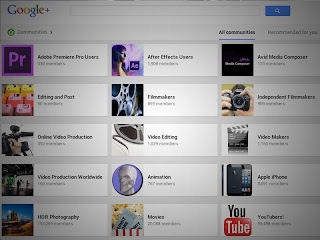 Video Editing - One of the largest gathering places for video editors on Google+. Editors from all over the world discuss NLE solutions, events and job postings in post production. Video Makers - A large community of Video Makers on the Google social network. Members of this community can discuss events, video making and tips for better video production. Video Production Worldwide - A place to interact with video production professionals worldwide. This community includes discussions on video pre-production, production and post production. All of these communities are great resources to learn new techniques and to meet your peers in the industry. So happy our community "Video Production Worldwide" (now changed to Video Production Professionals) made your list. I am also a member of many of those communities. I didn't know about "Video Makers" though. Thanks for the tips! I'm glad this blog has come in useful.